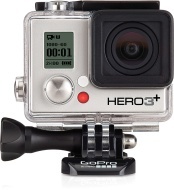 alaTest has collected and analyzed 5593 reviews of GoPro Hero3 Silver Edition. The average rating for this product is 4.4/5, compared to an average rating of 4.0/5 for other Camcorders for all reviews. Comments about the battery and portability are overall positive. The price and image quality also get good comments. Some have doubts about the viewfinder, while there are some mixed views about the reliability. We analyzed user and expert ratings, product age and more factors. Compared to other Camcorders the GoPro Hero3 Silver Edition is awarded an overall alaScore™ of 91/100 = Excellent quality. alaTest has collected and analyzed 245 user reviews of GoPro Hero3 Silver Edition from Amazon.co.uk. The average user rating for this product is 4.2/5, compared to an average user rating of 4.0/5 for other Camcorders on Amazon.co.uk. People really like the price and battery. The image quality and size also get good feedback, whereas some have doubts about the reliability and portability. alaTest has collected and analyzed 2047 user reviews of GoPro Hero3 Silver Edition from Amazon.com. The average user rating for this product is 4.0/5, compared to an average user rating of 3.9/5 for other Camcorders on Amazon.com. Views about the battery and price are overall positive. The portability and image quality are also appreciated, but some have doubts about the viewfinder and reliability. alaTest has collected and analyzed 1 user review of GoPro Hero3 Silver Edition from Amazon.ca. The average user rating for this product is 5.0/5, compared to an average user rating of 4.1/5 for other Camcorders on Amazon.ca. A slimmed down HD Hero 2 with Wi-Fi? Yes please. But is there enough in this Silver action-cam to stop us waiting for the flagship Black Edition? The HD Hero 3 Silver Edition continues to defend its crown as the first choice in action cameras, but expect it to be outclassed by the Black Edition. Good camera. Wish it had more FPS options, and I wish it balanced light better, but I like it. Love this little camera. It's easy to use and takes great videos. The one thing I don't like is the cover for the memory card and cables is not attached to the camera and could be easily lost when you take it off. Works great ! So small and easy to fit anywhere! Comes with extra shells so that was a plus . The wide angle view is awesome. Photo quality is great too. Couldn't be happier with my purchase!